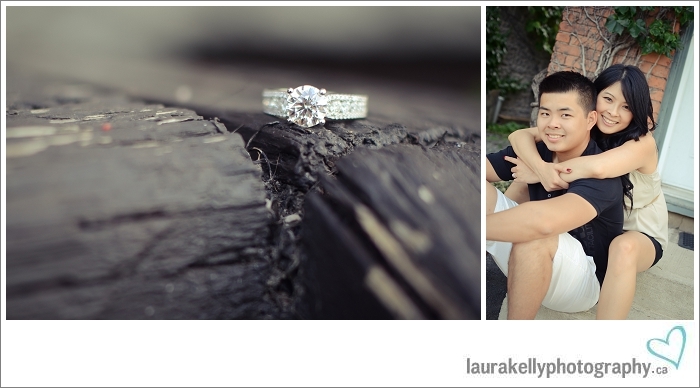 Next up on the books, an engagement session for Maria and Trevor. Oooh fun! That's what I thought right before I grabbed all my gear and hit the road, but unfortunately...I didn't get very far. Although it was a slightly less dramatic flat tire than last time, it was still a pretty major setback. Lucky for me, Maria and Trevor are unbelievably sweet, and forgave me for having to postpone our session for three hours later. And I firmly believe that they were rewarded for their patience with this FANTASTIC early-evening light! BAM. Now that's a ring! Such a cute couple to be. I am so happy for you guys. Congratulations and I wish you all the best.